With less than a month to go for the consecration of the Aadhi Yogi Alayam, the entire ashram is gearing up for the mega event. In this post, we are listing out 10 things to know about the Aadhi Yogi Alayam. The consecration of the Aadhi Yogi Alayam is right around the corner, and the entire ashram is revving up for the December 23/24 event. Construction is happening at break-neck speed and the Alayam is literally growing in front of our eyes. 1. It is an offering and tribute to Shiva, the Aadhi Yogi – the First Yogi. 2. 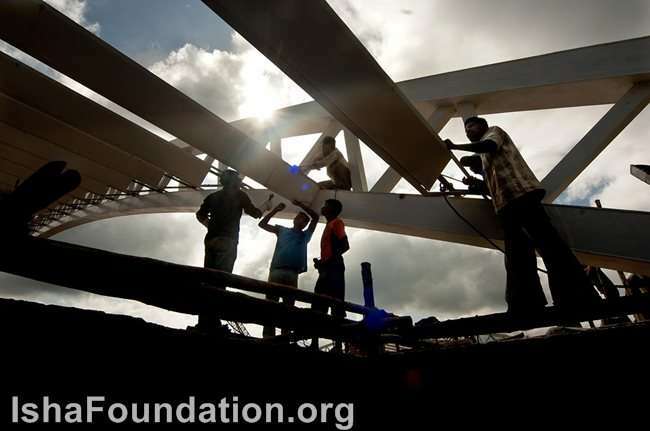 It has been specially designed and is being consecrated with the vision to raise human consciousness. 3. At 82,000 sq ft, it is the largest free spanning hall in India. 4. The entire hall is column-less, open and unobstructed. 5. 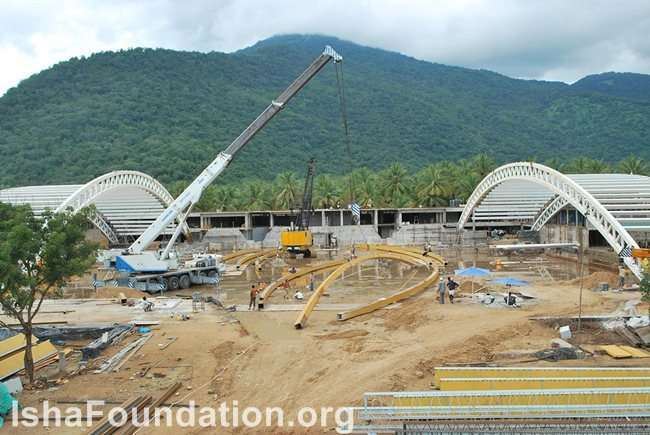 Unlike most buildings, the main hall of the Aadhi Yogi Alayam is being constructed without the use of cement or concrete. This ensures a lifespan of centuries. 6. Huge 50-ton granite blocks and about 250 tons of steel are used in the construction. 7. This megastructure has been constructed in just four-and-a-half months, with many parts being fabricated simultaneously at the same site, including the amenities around the hall. 8. 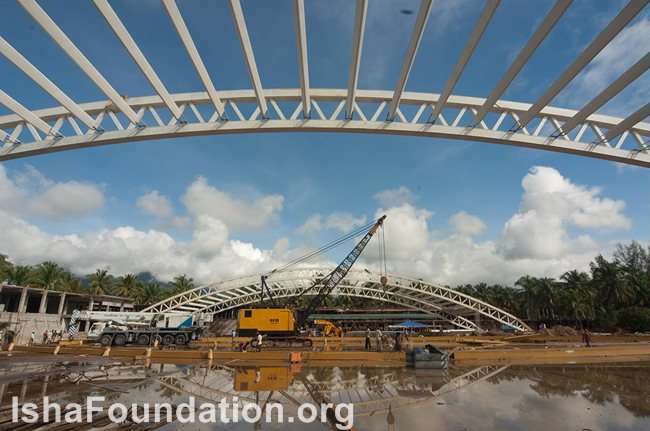 No contractors have been engaged in the construction and fabrication works, which have been supervised entirely by the Isha Engineering department. 9. 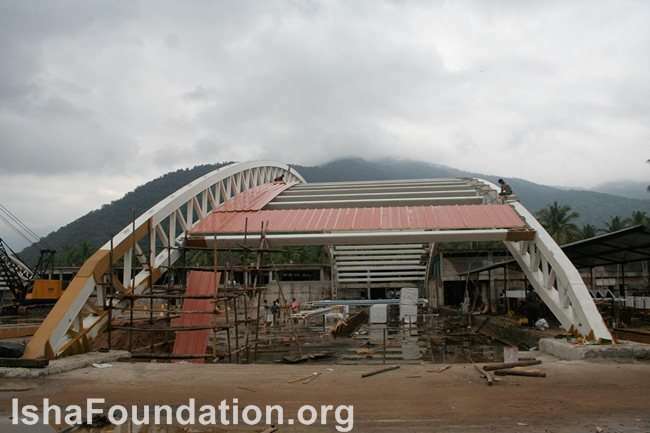 The construction team rebuilt a bridge (connecting the ashram to the main highway) that collapsed midway during the construction. 10. Who personally designed the unique and distinctive Alayam? Well that’s pretty obvious! It is a rare privilege to be a part of the consecration of the Aadhi Yogi Alayam, as Sadhguru will be transforming an empty space into a tremendous spiritual possibility. For further information on the consecration please visit this eflyer. Looks like an upcoming aircraft hangar - berthing port for some sub? Sadhguru's Grace... Worlds Unforgettable Movement is going to happen... Just Be there..
sadhguru is doing lot of things for human beings and for that at least we have to do our practices daily. Four and half months!!!!!!!!! Unbelievable truth. Hats off to the people who made this happen. During the training, the trainees have been going through sessions on Siddha Vaidya, an ancient system of medicine that originated in South India.